Arkansas Inland Maritime Museum at North Little Rock: Happy Birthday USS Razorback! "At 1130 the U.S.S. Razorback was placed in commission and the colors hoisted. Lieutenant Commander A.M. BONTIER, Commanding Officer, accepted the ship from the Commandant Navy Yard, Portsmouth, N.H. and the watch was set." 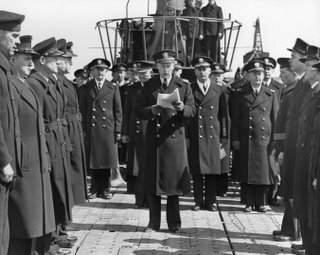 This photograph shows LCDR Bontier reading his orders and officially taking command. Additional photos of the commissioning ceremony, including photos of the officers and crew, are available on the AIMM Website. We have a page set aside especially for photographs of the Commissioning. Copies of the deck logs are also available by contacting AIMM directly. Happy Birthday to Shorty Hagerman!